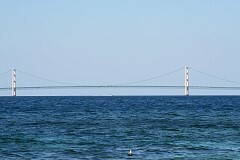 This picture of the Mackinac Bridge was taken in Mackinaw City. Like many historic places in the Great Lakes region, Mackinac Island's name derives from a Native American language. Native Americans in the Straits of Mackinac region likened the shape of the island to that of a turtle. Therefore, they named it "Mitchimakinak" (Ojibwe mishi-mikinaak) meaning "big turtle". The French used a version of the original pronunciation: Michilimackinac. However, the English shortened it to the present name: "Mackinac." After being in Niagara Falls for three nights, we hit the road and covered a lot of ground - all the way to the Mackinac Bridge. We tried to stay at the Best Western Dockside Inn here in Mackinaw City, but they gave our room away at 5:00 p.m. because, in my opinion, they wanted more money for it than they were going to get from our reservation rate which I made on the Internet months in advance. Tourism is down this year, so I guess they needed the money. This data (above) validates the perception among hoteliers that because of higher gas prices the number of tourists is down from a year ago. 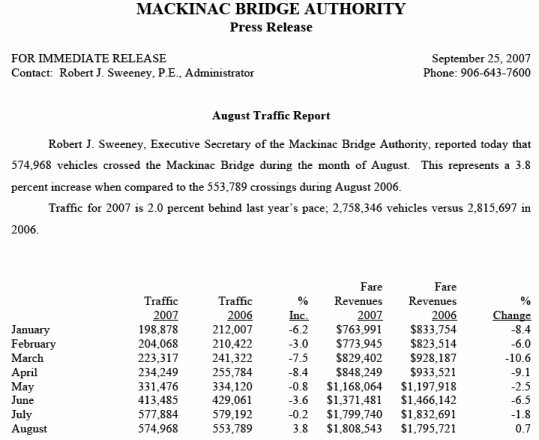 Note that we helped reverse this trend for our August crossing of the bridge. 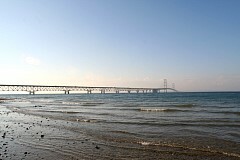 The Mackinac Bridge connects the upper and lower peninsulas of Michigan over the five mile wide Straits of Mackinac that connect Lake Michigan to Lake Huron. Before the bridge was here you had to take a ferryboat. The Mackinac Bridge's towers are 552 feet above the water: the height of the roadway at mid-span is approximately 200 feet above lake level. The bridge contains over 5 million rivets. The bridge was officially begun in May 1954 and opened to traffic on November 1, 1957. Five men lost their lives while working on the bridge: one of the deaths was a heart attack, one was a diving accident (the bends) and three were falls. It's early in the evening. 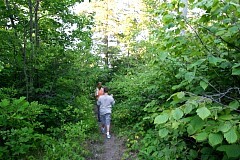 I am following my kids through a path from the highway to Lake Huron. I feel like an early explorer. The name of the lake is derived from early French explorers who named it based on the Huron people inhabiting the region: "Lac des Hurons" (Lake of the Huron Indians). Huron was the first of the Great Lakes to be discovered by European explorers. 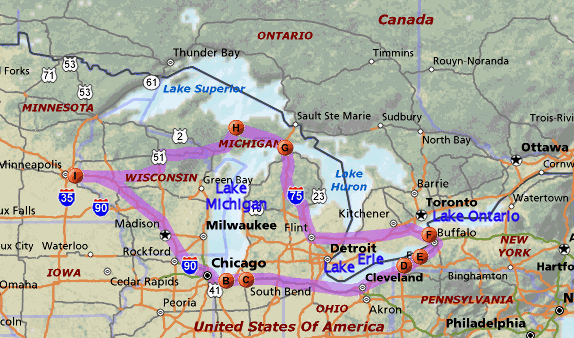 Lake Huron is the third largest of the lakes by volume. Lake Huron is at the same level as is Lake Michigan. 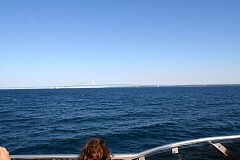 They are joined together by the wide Straits of Mackinac. 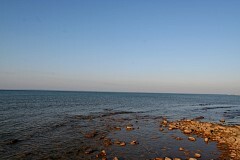 Lake Huron has a lake retention time of 22 years. The average depth is 195 feet, while the maximum depth of the lake is 750 feet. Water flows out from Lake Huron into the St. Clair River. From there water flows to Lake Erie. 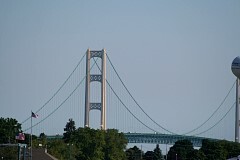 The Mackinac Bridge is currently the third longest suspension bridge in the world. The Akashi Kaikyo Bridge in Japan is the longest at 12,826 feet. The Great Belt Bridge in Halsskov-Sprogoe, Denmark is the second longest with a total suspension of 8,921 feet. The suspension portion of the Mackinac Bridge is 8,614 feet. 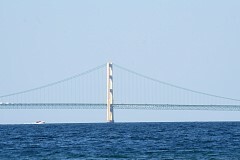 (The total length of the Mackinac Bridge is 26,372 feet). We paid a toll of $2.50 to cross the bridge. All suspension bridges are designed to move to accommodate wind, changes in temperature, and weight. It is possible that the deck at center span could move as much as 35 feet (east or west) due to high winds. The deck would not swing or "sway" but rather move slowly in one direction based on the force and direction of the wind. After the wind subsides, the weight of the vehicles crossing would slowly move it back into center position.